The revenues from exploiting large exhaustible resources such as oil can pose significant challenges for a country. Some governments have set up nonrenewable resource funds (NRFs) as a response to these challenges. 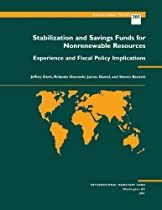 This paper examines whether such funds can help countries pursue good macroeconomic and fiscal policies and how they should be designed. It also highlights the additional risks and possible disadvantages to establishing an NRF. Although the focus is largely on oil-producing countries, examples are drawn from other nonrenewable resource-producing countries under appropriate circumstances.